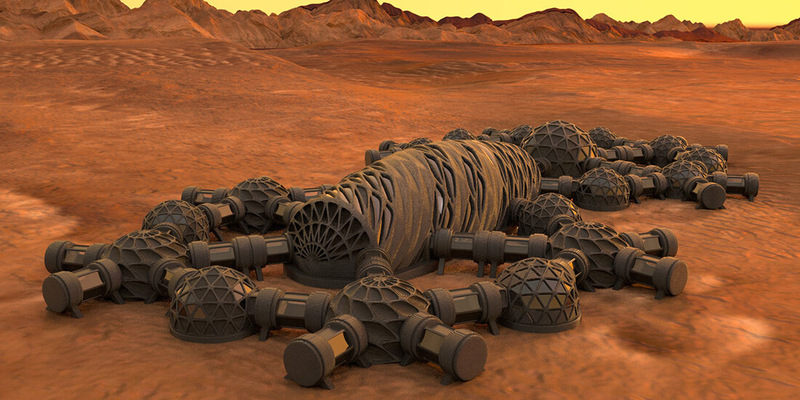 Human settlements on other planets probably will build structures using additive manufacturing with resources found onsite on the planet’s surface. Many sci-fi conceptions of space exploration have envisioned astronauts running experiments on a planetary surface and then returning to a small base composed, principally, of the ship that took them there. But lengthier missions, if they ever happen, will require more extensive infrastructure: habitats, launch and landing pads, blast walls, meteoroid shields, cryogenic fuel and oxidizer storage, and other facilities. A human mission to Mars would entail astronauts living and working in structures built on the Martian surface. But what would those structures be made of? Because only so much material can be brought from Earth, Mars explorers would have to learn to build using materials found on Mars. That may seem a mundane problem, compared to getting a crew to Mars, but it presents a host of complexities—problems on which NASA scientists and engineers at the agency’s Granular Mechanics and Regolith Operations (GMRO) Lab, at the Kennedy Space Center at Cape Canaveral, Florida, are actively working. 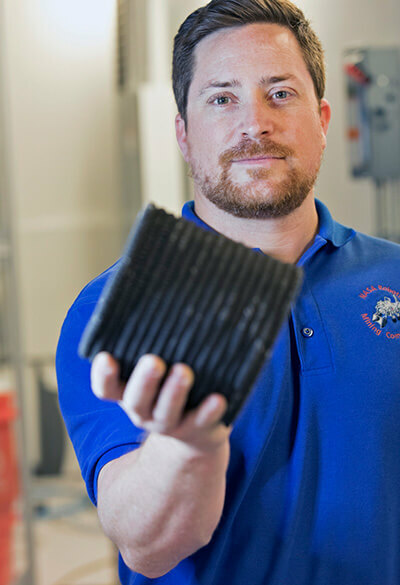 NASA Research Engineer Nathan Gelino says off-Earth additive construction using regolith is viable, but more needs to be known about the material’s load-bearing and strength qualities. Courtesy NASA/Glenn Benson. Extraterrestrial buildings probably will be built through additive construction using a large-scale 3D printer, says NASA Research Engineer Nathan Gelino, who works at the GMRO Lab (also known as Swamp Works). Additive construction is a proven, even routine, process on Earth. But it will present significant engineering challenges off Earth, not least because of the exotic soil astronauts would need to use as building material. Asteroids bombard rocky bodies such as moons, creating fine debris that lofts up and falls back down across the planetary surface. After millennia, this builds up a deep layer of crushed rock that scientists call regolith. The material is somewhat dangerous to work with. Like any fine-grained rock dust, it is a respiratory hazard; regolith could be carcinogenic in the lungs in the same way asbestos is. Black Point 1 (BP-1), a waste product of asphalt production, is a lunar-regolith simulant that the GMRO Lab uses. 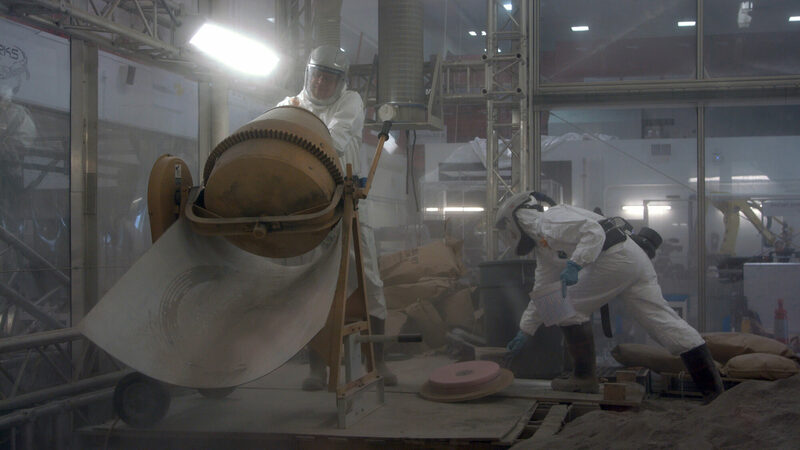 It contains silica, so silicosis is a concern for investigators, requiring protective respiratory equipment. 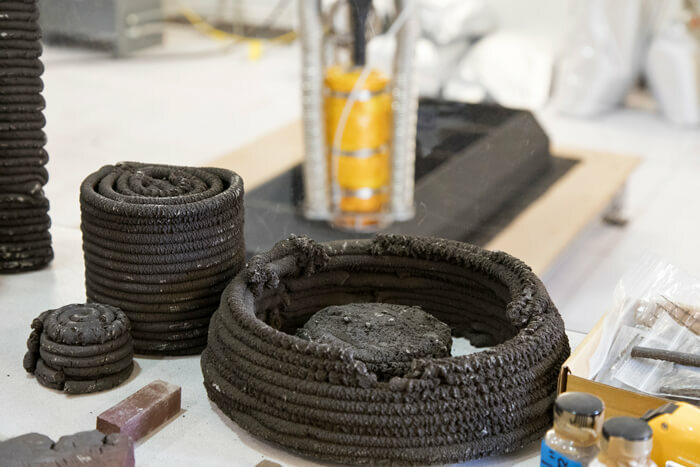 Scientists and engineers at NASA’s Granular Mechanics and Regolith Operations (GMRO) Lab explore solutions for 3D printing off-planet buildings using locally sourced material. Combining a small amount of waste plastic with crushed rock known as regolith can form an additive construction material that’s stronger than concrete. Courtesy NASA/Glenn Benson. Moreover, Buckles says, “regolith just behaves funny” compared to other additive-construction materials. 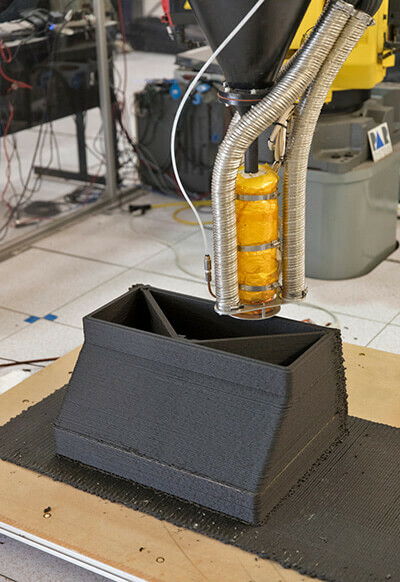 It will not flow like beach sand in an hourglass; rather, it tends to bridge, pack, jam, and “rathole.” NASA engineers have developed a variety of tricks to achieve the flow necessary to 3D print with regolith. Nevertheless, those same engineers insist that regolith additive construction will work. But building infrastructure off Earth will require a rethink about infrastructure itself. Thus, NASA must focus on “in-situ resource utilization,” enabling planetary explorers to live off the land. Off Earth, NASA engineers look at every pile of dirt as a valuable resource, potentially a source of hydrogen and oxygen to produce water—or the source elements to make iron-silicon-based steel. “When you get used to looking at things that way, you see the things you could do with a pile of regolith that you would never think about on Earth,” Gelino says. To anyone who has ever made a sand castle or worked with concrete, an obvious question about 3D-printing buildings in space is: Doesn’t the process require water? Yes and no, Gelino says. For certain concretes, water is necessary, but the good news is that water is not as scarce off Earth as popularly believed. There is harvestable water ice on Mars and in the shadows of deep craters on the moon, and water can be chemically synthesized from hydrogen and oxygen, both of which are abundant in hydrated Mars regolith minerals. NASA engineers also have sintered regolith into various kinds of pavers or bricks. The process involves molding the material under high heat; the end product has a consistency like sandstone, Gelino says. The required heat (about 1,200 degrees Celsius) demands a great deal of energy—a limitation, Gelino believes, but not an insurmountable problem. Payload capacity of delivery rockets will dictate the scale of the construction equipment that can be sent to the moon or Mars. The 3D printer that Gelino’s team is working with consists of an extruder mounted on an industrial robot arm and is capable of building a structure 6 feet tall and roughly 8 feet wide. It’s a proof-of-concept system; a flight-ready solution will need to be lighter and adapted to operate in extreme cold, radiation-exposure, and vacuum conditions. NASA’s Swamp Works innovation lab simulates lunar regolith using Black Point 1, a waste product of asphalt production. Courtesy NASA/Glenn Benson. Ideally, the additive-construction process would be entirely robotic, Gelino says. The printer might even be sent to its destination before astronauts arrive to build needed infrastructure.